A few years into teaching first grade in Tampa, Florida, Kamara was itching to do more. She loved to travel and had been doing so since she was an infant. Kamara really wanted to find a way to merge both of her passions. She'd also heard that many schools provided excellent packages. With housing, airfare, shipping, health insurance and often taxes paid, it seemed like a no brainer. Thankfully, Kamara had a wonderful co-worker who had just returned from teaching at the American School of Madrid and was excited to help her navigate this new world. It can be scary to think about changing your life, much less uproot your family and move halfway around the world. However, Kamara was ready and off she went. Kamara spent two years in Abu Dhabi, United Arab Emirates and then moved to Beijing, China for four years. Her experiences overseas were eye-opening, informative and life-changing. 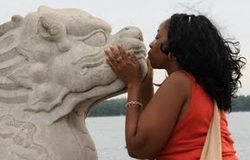 She was able to travel to over 30 countries, all while saving money. Kamara's travels took her to Cairo, Singapore, Siem Reap, Rio De Janeiro, Sydney and Auckland, just to name a few places. Kamara's job sent her to regional conferences in Borneo and Bangkok. For years, she was able to grow as an educator and continue her love of traveling. She graduated from Clark Atlanta University with a bachelor's degree in Early Childhood Education. In addition she obtained a master's degree in Elementary Education from Teacher's College, Columbia University. She is certified to teach in Florida and New York. Kamara has fourteen years of experience in education. Kamara currently resides in New York City with her family and puppy, Cinnamon. In her free time, Kamara loves to travel to new spots around the world. She enjoys making jewelry, practicing yoga and brushing up on her Arabic language skills.